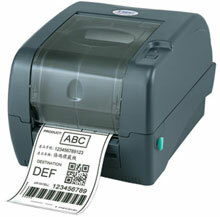 TSC TTP-247 - Desktop printer with cutter, Thermal transfer, 300 meter ribbon, 203 dpi, 7 ips, USB cable included. The new TTP-247 thermal transfer desktop barcode printer series delivers more performance for the price than any other printer in its class. Based on the design of its best-selling predecessor, the TTP-245 Plus, the TTP-247 runs at an impressive 7 ips, printing up to 4 inches wide at 203 dpi resolution. By using two motors instead of the usual one, TTP-247 series printers operate at lower torque, reducing noise, decreasing wear and tear, and extending printer life. The platform"s user-friendly design makes it easy for operators to load and unload ribbons, and its 300-meter capacity is more than four times the industry-standard length for desktop printers. 4.33" x 984' Black Wax Ribbon. Compatible with Industrial Printers. Single ribbon. Used with paper labels. Also available as a case (Part# 02000BK11030). The TSC 99-125A013-11LF is also known as TSC-99125A01311LF	or 99125A01311LF	.